If you're a manufacturer that's going to do custom liquid-cooling, you need to do things properly. That means using a Laing pump - a DDC or D5, which the vast majority of companies use in some form or another - and ideally you need to offer your own tubing and fittings too. That's certainly the case for the likes of Thermaltake and Alphacool, but while Raijintek has recently revamped its DIY water-cooling range, it doesn't yet offer kits or its own tubing or fittings. However, today we'll be looking at a few of its separate components including the Laing D5-based Antila D5 pump and reservoir combo, the CWB-RGB CPU water block, Calore C360D copper 360mm radiator, and Iris 12 RGB 256-3 fans. FIrst up are its Iris 12 RGB fans. The triple packs of this model, which Raijintek sent us, includes a six-port RGB LED hub as well as a wireless remote controller that allows you to switch between the RGB lighting colours, modes, and effects that are dished out by 15 individually-controllable LEDs under the white fan ring. They have a maximum RPM of 1,800. Like other controllers, you need to plug the fans into specific ports to adhere to an order so that lighting effects flow from fan to fan - for example across a radiator or along a case panel. You'll need a spare Molex connector to power the controller while the fans are all four-pin PWM. The remote control is certainly much easier than having to reach inside your case to get at a wired remote, and you can control the brightness of the lighting too - something that's not always possible, especially on motherboard headers. Whether you're at a LAN party or tradeshow or just want to tweak your case's lighting, the controller makes it very easy. The water block we're somewhat less impressed with. It only has a two-point mounting mechanism when all of its competitors sport more substantial four-point mounts, and the installation was especially fiddly too, especially on AM4 and LGA 1151, which both required no less than 18 different parts (!) to mount the water block. Even on LGA 2066, the fact that the mounting screws need to pass through threaded standoffs and then into the socket threads meant that you need to hold these standoffs while turning the screws. You could quite easily end up with a lop-sided mounting plate if you don't go through this fuss - it really is needlessly fiddly in our opinion, and many other blocks are easier to mount. 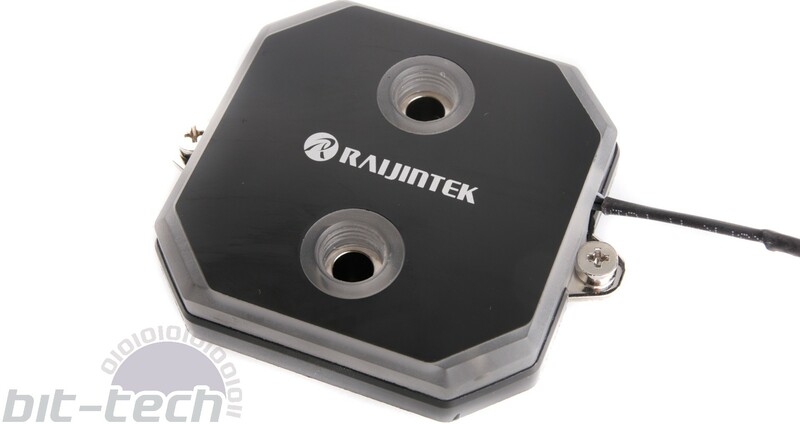 The plate itself, once installed is solid enough, but as mentioned the water block uses just two pre-attached screws to secure to the plate. The water block's RGB lighting was far less vivid than that of the fans too. We were expecting something a little punchier here, but otherwise aesthetically it looks great, and it sports its own four-pin RGB LED cable to connect to your motherboard.